American Federal Classics ™ Sheraton style double pedestal mahogany dining table, with satinwood crossbanded border and triple reeded edge. 48" wide, 29" high, each top 36" long, with two 24" matching finished leaves.This is a sampling of our AFC sheraton style custom made dining tables. I have placed numerous photographs on the details page of several different styles, both double and triple pedestal tables, with detail photos of several different pedestals. 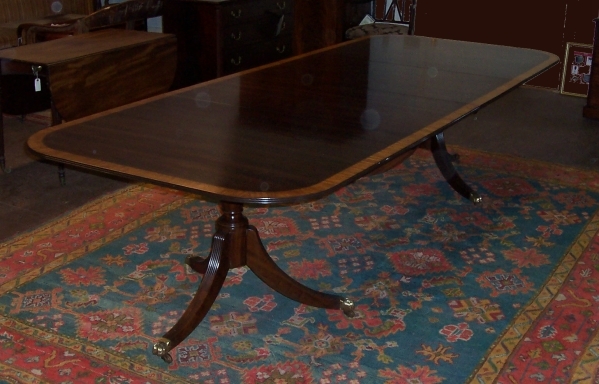 These tables are custom made and price is quoted per job specifications. Please email us here in order to receive a price quote or to answer any questions you may have. The price quoted below is for a banded table with urn form plain column and reeded legs with brass casters, no other carving. Email Us for a price quote.